With Aaron Taylor-Johnson, Elizabeth Olsen, Bryan Cranston, Ken Watanabe, David Strathairn. Directed by Gareth Edwards. Written by Max Borenstein. Rated PG-13 for intense sequences of destruction, mayhem and creature violence. 123 minutes. 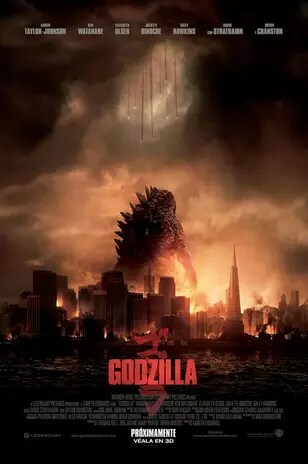 In 1954, Toho Studios released “Gojira,” which was subsequently recut for American audiences–with scenes with actor Raymond Burr added–and called “Godzilla.” The original remains an impressive film about an unstoppable force released by atomic blasts, made just nine years after Hiroshima. This led to many cheesier sequels, many of which were undeniable fun, as Godzilla fought Mothra, Ghidrah, Mecha-Godzilla, Hedorah, and a variety of other monsters, while much of downtown Tokyo got destroyed. After many years of action, a fully Hollywoodized “Godzilla” was released in 1998. The less said about it the better. Very few serious fans of “kaiju” (as these Japanese monsters are known) consider it a true Godzilla film. The new GODZILLA is another story entirely. It is an American kaiju film that fully respects its roots, and what the expectations of such a film are. So let’s be upfront: this is not a movie about the deeply complex script or multi-layered characters. What it does is what most of the Toho films were about, Godzilla–the “good” monster–defending us against “bad” monsters, with battle scenes that feature maximum destruction. That said, this is no schlock movie. After an opening credit sequence that gives a nod to Godzilla’s history, the action moves to Asia–the Philippines and Japan–where terrible discoveries are being made. Without giving too much away, it is the discovery of an egg or eggs containing a creature identified as M.U.T.O. (Massive Unidentified Terrestrial Organism). Destruction follows. Fifteen years later, Ford Brody (Aaron Taylor-Johnson) is called to Japan when his father (Bryan Cranston) is arrested for going into a restricted area where he once lived and worked as a nuclear engineer. History is repeating itself. It’s a long build-up to what will be the film’s central fight, between the weird creatures and Godzilla. The action moves from Japan to Hawaii to California, with Dr. Ichiro Serizawa (Ken Watanabe) suggesting that Godzilla may be nature’s response to the monsters and not the problem. Admiral William Stenz (David Strathairn) is more interested in destroying all monsters than in testing out Serizawa’s theories, while Brody, a nuclear weapons specialist, is trying to get back to his wife Elle (Elizabeth Olsen) and child. Director Gareth Edwards employs an interesting strategy to keep us interested in the stick-figure humans while we await the big monster battles. He gets a cast that is so good that we stay with them even when they don’t have much to do. Cranston and Juliette Binoche as his wife depart the film early, Strathairn, Watanabe, and Olsen get a very few scenes where they can develop their characters, and Taylor-Johnson gets to be heroic. They do their jobs, but all have done better work elsewhere. What we’re waiting for is Godzilla and M.U.T.O. to face off and when it happens it will thrill the hearts of Godzilla fans everywhere. We get the famous roar, and we get action that builds and builds to a crescendo. What Edwards and screenwriter Max Borenstein get is that while Godzilla is a monster, he is a monster we want to cheer. This is where the 1998 film went wrong. That Godzilla seemed to have wandered in from “Jurassic Park” and we were supposed to be rooting for the silly humans. Here Godzilla looks like Godzilla and he’s here to put the bad monsters in their place.